Is Auntie X buying the Lego vehicle or not? Will she definitely get it because it’s what he wants most of all? Should I get in touch to double-check because I can ask Uncle Y to get it if not? Effectively I end up managing H’s list for him. This of course keeps an element of surprise, but it’s yet another thing to do at a busy time of year and it’s all more stress. We’ve tried a few ways of managing this in the past like Amazon wish lists, but we haven’t really found anything that was entirely satisfactory. Gift Circle have come up with a way to make the gift lists work. It’s a place where friends and family can get together to swap wish lists, so it’s easy to choose and buy each other perfect gifts. 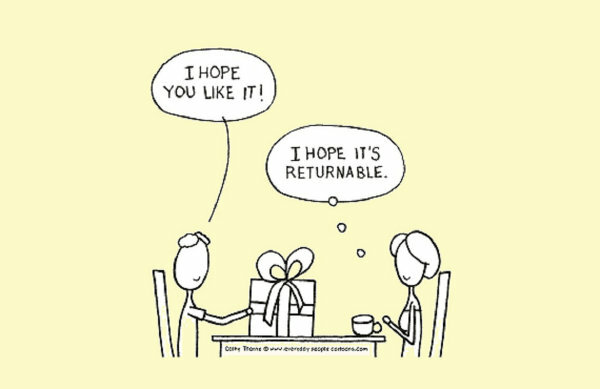 You won’t be racking your brains trying to think of a gift idea or buying the wrong thing or a duplicate. Not only that, it’s a way of keeping a track of what you’re buying for who and how much you’re spending. I was rather intrigued by the idea when Gift Circle got in touch and asked me to try out their site. I found it very easy to register: it took seconds. I then went in to create a list for H for this Christmas. There’s a box for the name, the occasion (a date like Christmas Day or their birthday) and you can tick a box depending on whether it’s for a child or not. You then add a browser button, if you want, and this is so easy, just click, drag and drop on your toolbar. 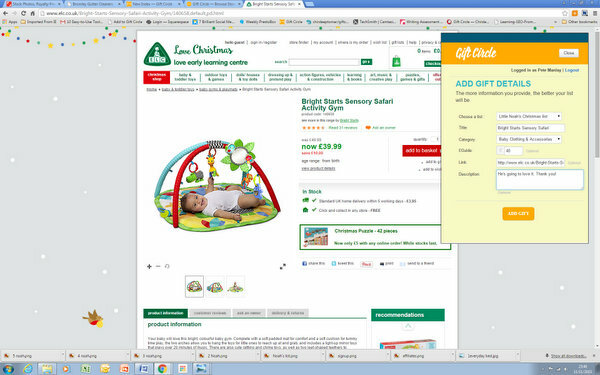 You can add things to your lists whenever you are browsing online or you can have a look from within Gift Circle itself. It will lead you through to click on a retailer and you will actually buy the gift from the online shop for whichever store you choose. 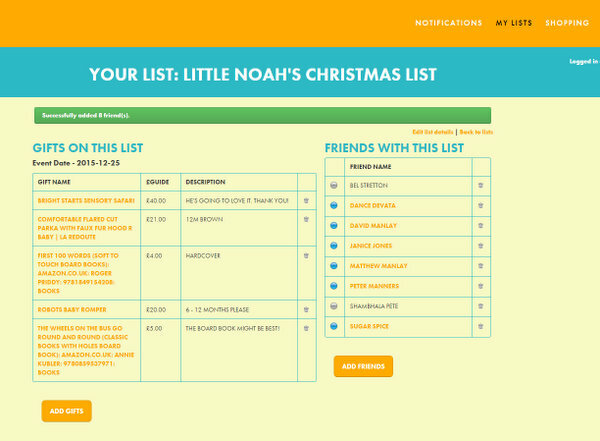 You can ask friends or family for lists and Gift Circle can link into your email contacts to make doing this very simple. Friends and family that you have invited will then be able to see the gift lists and will be able to mark things off as bought. They can even mark off as bought a bargain they picked up offline. The gift lists allow you to give quite a lot of detail, so you can specify ‘any colour as long as it’s not pink’ or ‘must have the flashing lights’ or ‘he takes size 9 to 10’ or whatever it is that’s essential. You could say please buy this one first if it’s within my budget or similar. I found that it all works very smoothly and I think I’ll be using this for H’s birthday, which will be upon us before we know it I’m sure. I think we’ll use it to make present buying a lot easier in the future for everyone, especially as I have family abroad who have to rely on online shopping for gifts. Oh what a great idea – we do lists for Chrismtas too, even for the adults, and it’s always hard to workout who is getting what for who…this would be perfect! Great idea, I usually make a list but am fed up with asking people what they want and then people asking me what I want. What a great idea! So much better than everyone ending up buying hats and scarves too which is what always seems to happen with our family! This would be great for a christening! We are a really small family, so this isnt needed for us!